Today's top score, pictured at left, is worth celebrating. It is "Pennario Plays Chopin For Young Lovers." A classic 1970s reissue! My friend Lizzie went with me making the rounds of garage sales and one estate sale which is where this record was purchased. It is funny because while the estate sale lady was filling out the sales slip, Lizzie tried telling her that I was writing a book about Leonard Pennario, that he was my friend. And the woman, who had been gabbing and gabbing with us, all of a sudden just shut up and frowned down at the sales slip! She seemed not to hear a word Lizzie was saying. She never acknowledged hearing us saying anything about Leonard Pennario. Hahahaa! That is so typical. That always happens to me. Once when I had a Mass said for Pennario there was a glitch and his name did not get announced. All the other times, you hear who the Mass is for. This time, no. I am kneeling there in my pew breathing, "Say his name. Say his name!!" Because this was a big deal for me. But no. In time this unacceptable state of affairs will improve. Meanwhile that record album was in good company today. I got a lot of quality items including two custom designed hippie hula hoops, visible in the picture above. Someone had designed them by hand and they were priced $5 but me, I bargained like a Moroccan in the square and got them for $1 each. 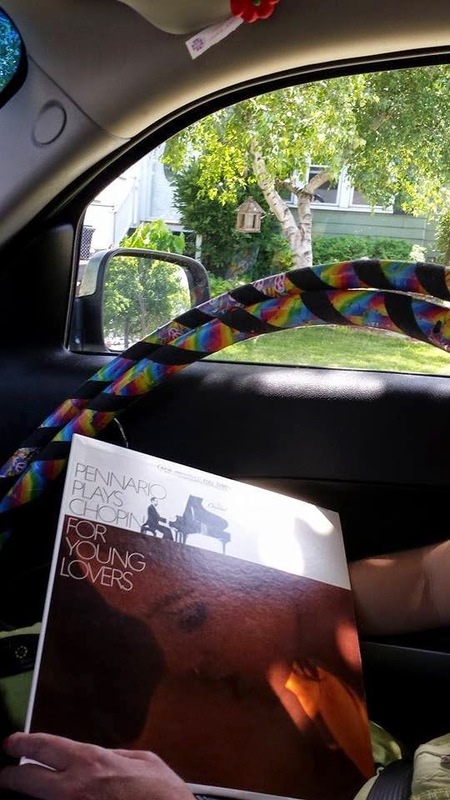 Pennario would have hated that the hippie hula hoops with their peace signs and rainbow colors were there with his album. But it could not be helped. We had bought so much stuff that there was no more room even in the back of spacious Lizzie-mobile, which is a huge SUV. When Lizzie and I garage sale we can be stopped only when buying anything further becomes, for some reason, impossible. Once we garage-saled literally down to our last dime. Another time we ran out of time. Today, the problem was, every square inch of the car was filled up. I also got a dress and an antique lamp and three cookbooks and two dresses and two chairs which, I have every hope they will prove as lucky as the last chair. I also got a whole bunch of linens some of which I will have to display on this Web log. A fine couple of hours of shopping! Yes, it happens. In one of his books, Trump tells of a ribbon-cutting celebration in New York at which the name of a dignitary who had been absolutely crucial to the project (which was about to be inaugurated) was entirely omitted from the program - he was not mentioned and was not even introduced to the public. Politics is funny that way, which is probably not applicable in the story you related here. We hope.